« Scholarly Consensus in Biblical Studies — Does It Mean Anything? Carrier has a PDF presentation addressing these points. And thou shalt take gold and silver: and shalt make crowns, and thou shalt set them on the head of Jesus the son of Josedec, the high priest. And thou shalt speak to him, saying: Thus saith the Lord of hosts, saying: BEHOLD A MAN, THE ORIENT (i.e. RISES) IS HIS NAME: and under him shall he spring up, and shall build a temple to the Lord. The JTS article also notes the striking contrast between the Zechariah 6:12 claim that the “Rises” “will arise from beneath” while the Gospel’s claim is that this Jesus-Rises “will visit from on high“. This Jesus was also said in the same book to be symbolic of two burning lampstands fueled by olive oil. The word is not the same as “messiah” but it is surely suggestive. And the Lord said to Satan: The Lord rebuke thee, O Satan: and the Lord that chose Jerusalem rebuke thee: Is not this a brand plucked out of the fire? And Jesus was clothed with filthy garments: and he stood before the face of the angel. Who answered, and said to them that stood before him, saying: Take away the filthy garments from him. And he said to him: Behold I have taken away thy iniquity, and have clothed thee with change of garments. It is not the gospel story, but it is not hard to see it as an analogue of the crucified Jesus who was raised again. Much more can be said and probably has been said in discussions that have escaped my notice. I have also heard of one of the companions of Moses having uttered such a speech as this . . . . It sounds like Philo is referring to one of the many Jewish interpretations and speculations about the biblical figures that in this instance happened to support his primary theme. It’s an interesting mix: we have persons in the bible narrative being interpreted as allegories; we have a Jesus who is said to be the Rises/Dawn Rising in Zechariah, in Philo and in the Gospel of Luke; he is the son of Josedec whom Spong and others have noted is close to “Joseph”; the same is said to be the firstborn Son of God and Logos (Word) with God from the beginning; there is also suggestion of this Jesus being an anointed one (messiah) and having been attacked by and rescued from Satan to be raised (from “below”) to glory. A lot of interesting, if speculative at this point, stuff. What it shows is yet another set of passages that could have fed the ideas from which Christianity took root. Posted on 2012-08-01 01:00:09 GMT+0000 by Neil Godfrey. This entry was posted in Biblical Studies and tagged Book of Zechariah, Gospel of Luke, Historicity of Jesus, Jesus, Philo, Richard Carrier. Bookmark the permalink. It seems to me that Philo was confused that the high priest Jesus was called “the East” and then said “Aha, this title makes no sense if applied to a person. But if the title ‘the east’ were applied to the Logos, that would make sense”. It doesn’t look like he’s saying that there was a heavenly Jesus who was the Logos. He’s saying that there was an earthly Jesus who was nonsensically given the title “the East” and argued that this title should actually belong to the Logos. It doesn’t matter either way to a mythicist position. Either way, the earthly “Jesus” referred to was not an historical figure. Or, if he was, he wasn’t in anyway what we would consider Jesus of Nazareth. I believe this is very persuasive, excavating a pre-Jesus Jesus, who was clearly heavenly. I think this is a significant piece of the puzzle coming together. Good job, Carrier! No, supposedly the Jesus here was historical. At least, he was thought to have lived on Earth and officiated as high priest. Yes, “that incorporeal being” is the Logos, not the high preist Jesus. J. Quinton, you appear not to have read Neil’s post or Philo’s text with any care, as your comments here are completely wrong. Philo’s ‘incorporeal being’ is the man named East, who Zechariah says is the king Joshua – a name that is the same as Jesus, who is anointed (Christed) as king. Philo says that applying the name East (ie Jesus Christ the Logos) to an earthly man makes no sense, calling it ‘very novel indeed’. Philo was a coherent mythicist, and was not confused as you say. The confusion entered the picture when Philo’s high vision was degraded by the literalism that became Christian orthodoxy. I have also heard of one of the companions of Moses having uttered such a speech as this: “Behold, a man whose name is the East!” (Zec 6:12.) A very novel appellation indeed, if you consider it as spoken of a man who is compounded of body and soul. Instead, if you look upon it as applied to [the Logos] who in no respect differs from the divine image, you will then agree that the name of the east has been given to [the high priest] with great felicity. For the Father of the universe has caused [the Logos] to spring up as the eldest son, whom, in another passage, he calls the firstborn; and he who is thus born, imitating the ways of his father, has formed such and such species, looking to his archetypal patterns. There’s a guy that’s called “the East”. But this title “the East” makes no sense for a regular flesh and blood person. But if we apply it to the Logos, that would make sense. And since the Logos is the archtypal high priest, it now makes sense that a flesh and blood high priest is called “the East”. The only way you could interpret it as saying that Philo is calling the guy who is called “the East” the Logos is if you completely ignore the bolded parts. Quinton: I usually like your remarks, but would have to respectually disagree here. I think the references passage(s) ARE consistent with thinking of Jesus as just the Logos. Next, 3) if the material on Jesus looks “to his archetypal patterns,” that is clearly an invocation of Plato’s theory of Forms; the idea there being that almost all apparently material things here on earth are imperfect “copies” or “shadows” of the eternal forms, “models,” or “patterns” (cf. Gk. “paradigms”), in heaven. Philo says “if you look upon it [the name East] as applied to that incorporeal being [the Logos] who in no respect differs from the divine image, you will then agree that the name of the east has been given to him [King Joshua] with great felicity.” Philo is saying King Joshua is incorporeal, the high priest is not flesh and blood, and the anointed King Joshua (ie Jesus Christ) is a myth. Neil, Could you comment further on interpreting “branch” in Zec 6:12 as “rises”? What is interesting is Luke’s taking the “rises” of Zechariah to apply to a rising of (pre-existent) day-star or sun, while Zechariah speaks of a “rising” from the ground below. Hence the Pauline mystagogical assertion by the Christ that his body and blood comprising the sacred meal are the fruits of the earth…..
“Zechariah,” near the very end of the Old Testament, is a complex text, with indeed some implications of a rather “eastern” or heavenly annointed savior. But? Interestingly, this seemingly late book of the OT also indicates some problems with one or two such alleged saviors. First, there ARE some interesting parallels with Jesus; the book is the story of the “prophet” “Joshua,” of the time for example; also speaking of “two anointed” helpers. Seeing the Joshua of the time, “Crown”ed too; even over kings. And it all turns into a prediction of a coming, rather Apocalyptic Day of the Lord; when some similar Lord comes to earth, to reward the good and punish the bad. But interestingly? Though this book seems to indeed, provide some Jewish/Old testament input into the NT and the story of its own “Joshua,” or Jesus? This book at the same time, warns of many false things, deep in some related religious persons in the midst of all this. Even our “shepherd”s can be “false,” Zech warns (10.3 – 13.7). The text suggesting that even our shepherd christ of alleged savior – might be after all, a … false christ. OR here, a “worthless shepherd.” 11.17. No doubt,the New Testament and it’s “Jesus,” are formed of elements of ANE, Greco-Roman, Platonic, but ALSO Jewish legends and expectations. But? Curiously those relevant Jewish legends indicated that there would be problems, even in our highest religious “shepherds.” (In parallel to say, Isa. 14.13-20; the famous 21.23-25; and many NT warnings about “False” and “anti” Christs). The OT and the book of the prophet Zechariah indeed look forward to a savior of some sort. One perhaps in part, indicated by the heavens, the light of the eastern sun and so forth. But this same book also warns of many false things, even in our would-be annointed saviors; even “shepherds.” While the “pierching” of one of the shepherds, prophets, does not indicate approval, but disapproval, by God (13.2 ff). If you differ radically with the prevailing translations, by the world’s greatest experts? You should cite your own authority. Personally I intuitively prefer the “received text” as it is called. In this case. Or the NT mod. Since otherwise you deviate from a consistent theme in the Bible, (and in real life) of a false messiah, false shepherds, and so forth. In fact, even one or two of the first historical shepherdic models – Cain; David, the sheepherders – made mistakes now and then. So that your current reading looks too apologetic? Reblogged this on Ehrman Paine Strauss Wells. I found the earlier readings, through Philo, of a saving Logos, as “son,” more convicing as a Platonistic reading of the OT. Philo though, is famous for dematerializing and metaphoricalizing ; quite like the later Origen, and the Gnostics. And whether his readings were true to the original Jewish texts or not, his writings show what many Jewish thinkers were doing, just before Jesus; Philo being Jesus’ slightly older contemporary (and model? ), in Alexandria Egypt: everything in the OT is being read as an allegory of the spirit, etc.. In the case of Zech though, what interests me more than Philo’s reading? Are very clear indications of more historical roots to Jesus. Historical roots that however suggest strong that the origin of the whole story of a “Jesus” or “Joshua” … was in large part a confused retelling of the story of the earlier prophet Joshua. The original Joshua or Jesus .. lived in an era of a corrupted Temple or Judaism. And who was alleged to have been given a commission from God to therefore, to assume a crown of Jewish leadership, and refound the temple, refound Judaism.? Though as popularly translated, the text also warns of problems with/in this saving prophet, or shepherd, or Jesus. Who is “pierced” to indicate disapproval by God. By the way? 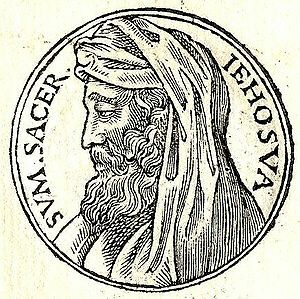 Bits of earlier scholarship suggested that Hellenized Jews like Philo were not above taking old Jewish legends, even holy OT stories … and making up new, midrashic or parable-like reformulations of the old stories. Then presenting them as biographies of real persons. And in fact? Just the slightest reformulation (or say popular misunderstanding) of the storty of the prophet Joshua, could have started off the whole legend of our Jesus Christ. While an origin around Philo, would explain the rather Platonistic/spiritual overtones of the new Joshua: Jesus. Philo, the slightly older contemporary of “Jesus” – Philo b. 20 BC – Philo or someone around him, could have created their “Jesus” c. 10 AD or so. Corresponding closely to the dates we have for the “birth” of Jesus. Next, the mythical nature of Melchizedek is explained at Heb 7:3: “Without father or mother, without genealogy, without beginning of days or end of life, resembling the Son of God, he remains a priest forever.” Hebrews sees Melchizedek as the type for Jesus, a priest without genealogy. Contrasted to the weak mortal Levitical priestly order, the strength of Christ is in his eternal incorporeal nature. The apologist line is that 7:3 really meant ‘without recorded beginning or end’ against the plain statement of the text that Melchizedek ‘remains a priest forever’. As Heb 7:24-26 says “because Jesus lives forever, he has a permanent priesthood… exalted above the heavens.” The plain meaning is that salvation is from the eternal idea, “the same yesterday, today and forever” (Heb 13:8), a line that contradicts the incarnation idea of Jesus changing from eternal essence to corporeal existence. Melchizedek appeared in Genesis 14, and then Psalm 110, as the high priest who blessed Abraham and the priest-king in whom messianic hopes are vested. The line where Jesus says ‘before Abraham was, I am’ at John 8:58 is supported at Heb 3:3 which says Jesus “has been counted worthy of more glory than Moses, inasmuch as he who built the house has more honor than the house.” This plainly means Jesus came before Moses, because the builder, Jesus as God, pre-exists the house, Moses as the Jewish people. As Paul puts it at 1Cor 10:4, the Israelites with Moses “drank from the spiritual rock that accompanied them, and that rock was Christ.” The original vision of Christ was pure myth, and the story was later carnalized for base political motives. My remarks on “prevailing traditions” were directed at a comment in favor of the Logos, that no longer seems to exist; and so my 6:03 statement might simply be deleted, or disregarded. Thanks for your useful explanation. As Jesus said, his “kingdom is not of this world.” Nor are his origins. While his truths are more “spiritual,” relating to spirit “Heaven,” more than being about his literal biological “family,” and so forth. Or even about a physical crucifixion; which was about putting our material flesh aside – including physical trials, like a physical crucifixion. In order to relate more to spiritual/ “cosmic” things. That is the way an average sermon might presents all this; how many sermons present to everyday people, the residues of Gnosticism and Platonism that are found in the BIble, and the epistiles, especially of Paul. To be sure, there are problems with Paul’s over-spirituality in turn; and especially with the Gnosticism it would become. Still, Paul’s spiritual model was very influential, and needs to be understood. While of course Doherty argued that Paul’s vision was the real foundation of Christianity. Checking the original source, it appears the Philo quote comes from book XIV not book XV. This should probably be fixed in the main post. Thanks, Evan. Have corrected the post. I remember first suggestisng the notion that the celebrated passage in Zechariah was the actual origin of the name ‘Jesus’ for the Pauline hero of his cult back in 2009-2010 I believe, given that his theory that the movement originated with an assiduous scriptural study along with visions made sense to me. These ideas require close examination and it would appear that the surface has only been scratched. [Interesting to find this terminology in Luke; interesting too that ‘Rises’ will have been his Name given that hearers of Paul at the Areopagus, acc. to that same Luke, mistakenly thought the apostle’s preaching to have been about a new god called ‘Resurrection’]. This business of the Redeemer’s secret Name also shows up in Asc. Is., another text it seems Paul quoted as Scripture.